Every other man in the scene seems to look in a different direction. As I approach the figure who leans far over the inert body, seemingly to more closely peer at whatever the anatomy tome in front of him is conveying. As I draw close, a small text box pops out telling me precisely this: that he is gazing at the book to make sense of what the body beneath him is saying in all its vascular and muscular complexity. As I subsequently approach each character the text box reappears with new information. A man’s voice also speaks out what the boxes contain. The voice is calm, unhurried; the English that’s spoken has a slight European accent. Then I notice the subtle music playing in the background, a hollow, atmospheric tune, the kind of music one would find in a sci-fi movie soundtrack, accompanying the protagonist’s first encounter with the cold and seemingly infinite reaches of space. It’s on a very short loop, so it sounds quite repetitive after a while. I experienced this right outside the Mauritshuis museum in Amsterdam, being assisted by a man who hands me an iPad and some headphones and allows me to step into the visual adventure. The painting I wandered through was “The Anatomy Lesson of Dr Nicolaes Tulp” (1632). 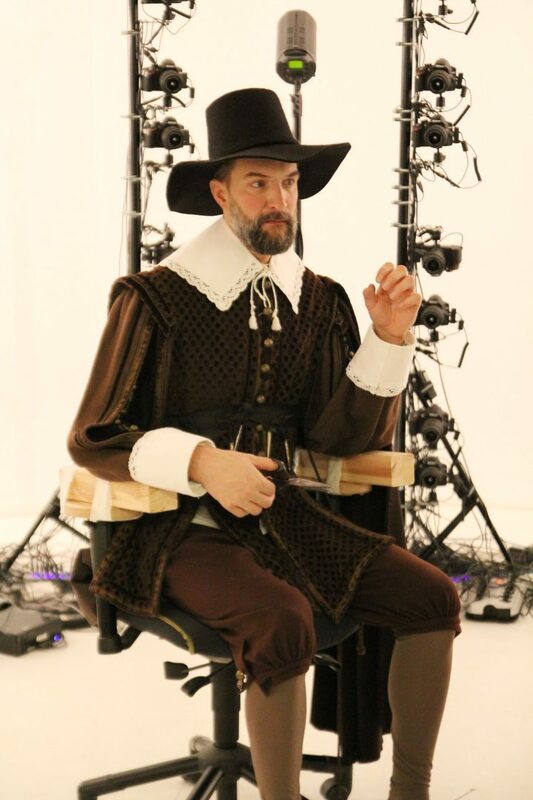 The app that allows me to treat it like a three-dimensional space is called Rembrandt Reality. It was developed by Capitola for release this year to celebrate the 350-year anniversary of the enormously famous Dutch painter’s death — a year which has been marketed with the theme “Rembrandt and the Golden Age.” The app exploits the technological innovation of augmented reality using holographic projections to essentially creating a portal into what was a two-dimensional space that expands into a third dimension that can be visually explored. The app allows virtual objects to be projected and placed into a scheme that visually reads like the physical world, so that as I step on cobblestones, I also step inside the space that’s depicted on the iPad screen. 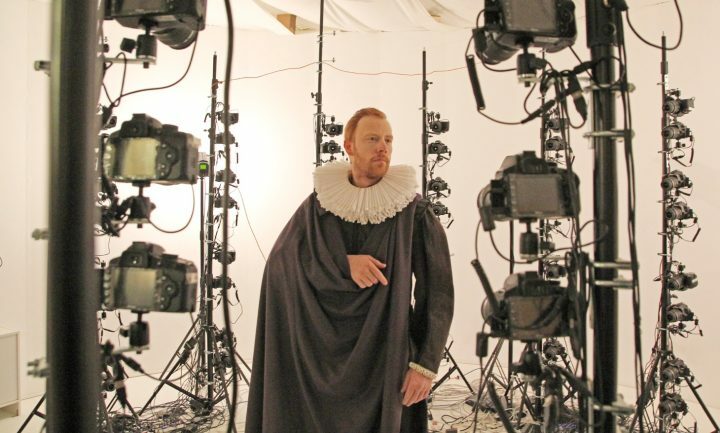 It was created by using real world lookalikes dressed in 17th-century outfits who were scanned with a 3D scanner made up of 600 reflex cameras. 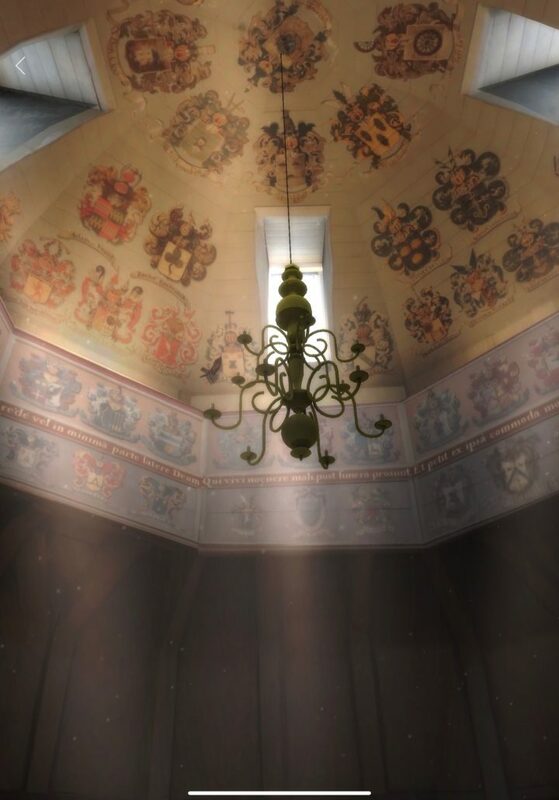 And the original theatre in the Waag where Dr. Tulp publicly taught his anatomy lesson was also captured with a 3D scanner. When I return to New York, I download the app and try it out again. This time there’s a woman’s voice (again with a European accent) guiding me through the realm of the painting. 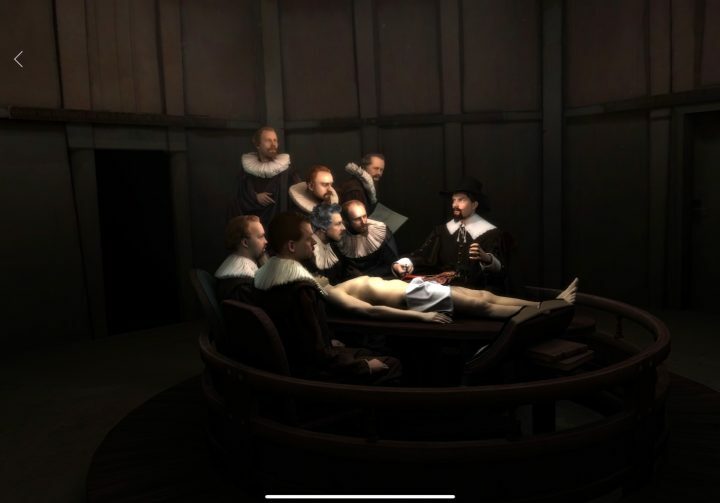 There are “hot spots” to click on, and one I activate prompts the voice to tell me that autopsies were typically carried out in winter when the bodies would decompose more slowly, and would begin with examining the major organs, but Rembrandt wanted to demonstrate the moment in the Dr. Tulp’s lesson where he shows how the muscles in the arm control the movements of the fingers. I particularly like that I can more see objects that are only partially visible in the painting, such as the anatomy textbook propped open on a stand opposite Kindt’s body. I won’t give much more away (except that interesting things happen when you look through windows). But will counsel the potential user that you do need quite a bit of space to explore the anatomy theater. The app recommends that the user go outside, which is worthwhile advice to follow. The next I open the app, I will do that myself. 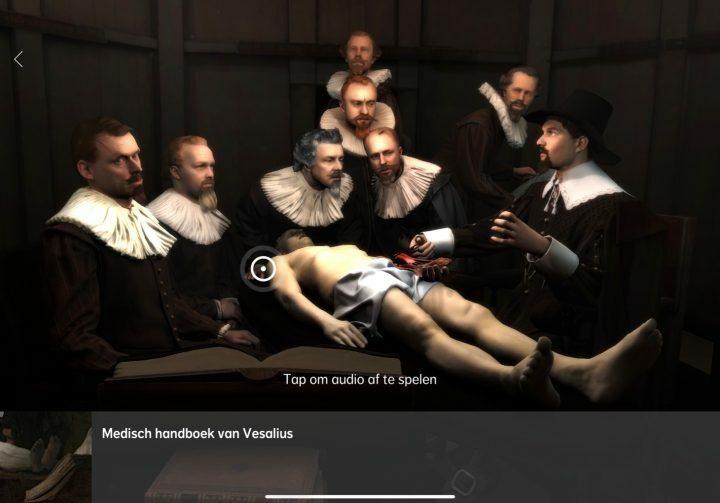 The Rembrandt Reality app was developed by Capitola is available free of charge from the Apple App and Google Play stores.